The Louisville Zoo is sponsoring a Kentucky specialty license plate! The plate features one of the world’s most stunning animals, the polar bear. Funds raised through this project provide on-going support to the Zoo’s critical global conservation efforts, as well as its statewide conservation and education programs. You can own one of these beautiful license plates and show your support for the Louisville Zoo for just $10 more than regular license and registration fees. The Zoo plate is available for purchase at your local County Clerk’s Office. The cost of purchasing the new plate is $44 ($10 is tax-deductible and goes to the Zoo). 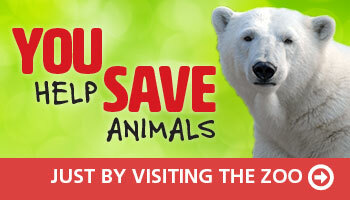 The cost to renew your annual registration is $31 ($10 is tax-deductible and goes to the Zoo). If you are converting from a regular plate, you will need to turn it in when you purchase your plate. Specialty plates can be available for personalization with an additional $25 application free annually. The personalization is limited to a maximum of five characters. For all other questions, contact your local County Clerk’s office. Conservation and Education The Louisville Zoo is involved in critical conservation programs through its management of wildlife and botanical collections at the Zoo and through programs worldwide including Dian Fossey Gorilla Fund International, Polar Bear International, Black-Footed Ferret Recovery Program, the International Elephant Foundation, American Chestnut Tree Conservation, Cuban Crocodile Project, Butterfly Initiative, Kentucky’s Blanton Forest and more. Since being designated as the state Zoo of Kentucky in 1980, we have found numerous ways to serve the citizens of the Commonwealth. Through our Kids & Conservation program we have distributed over a million Backyard Action Hero Activity books to students and teachers statewide. Well over 80,000 children visit the Zoo annually for field trips, overnight programs and family workshops. The Zoo also goes on the road to serve thousands annually through outreach programs. The Louisville Zoo, a non-profit organization and state zoo of Kentucky is dedicated to bettering the bond between people and the planet by providing excellent care for animals, a great experience for visitors, and leadership in scientific research and conservation education. The Louisville Zoo is accredited by the Association of Zoos and Aquariums and the American Alliance of Museums.